We have a brand new trailer with new footage for ‘22 Jump Street‘, the sequel to 2012’s ‘21 Jump Street‘ reboot that starred Jonah Hill, Channing Tatum, Ice Cube, Rob Riggle, Brie Larson, and Dave Franco. It was a surprise hit and did very well with critics. Phil Lord and Christopher Miller are back directing the sequel, which they are hot off the press tour for their amazing ‘LEGO Movie‘. Michael Bacall is also back as the film’s writer. We posted a trailer a little while back, which you can see HERE. But this new trailer is just as, or even funnier than the previous one. I cannot wait to see this sequel. 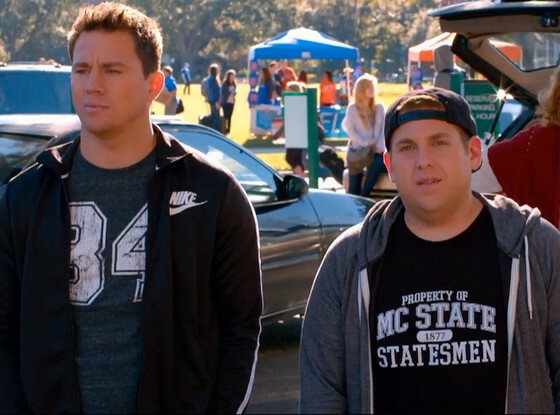 ’22 Jump Street’ opens on June 13th in the states. Enjoy. Johnny Depp To Return to “21 Jump Street”!!! This entry was posted on Wednesday, February 19th, 2014 at 11:49 am	and is filed under Film, News. You can follow any responses to this entry through the RSS 2.0 feed. You can skip to the end and leave a response. Pinging is currently not allowed. « Jada Pinkett Smith lands villainous role in ‘Gotham’!! Her dream had come true. She was a folk singer.